Mold Remediation Will Temporarily Displace Hanson Hall Residents | The Gettysburgian. 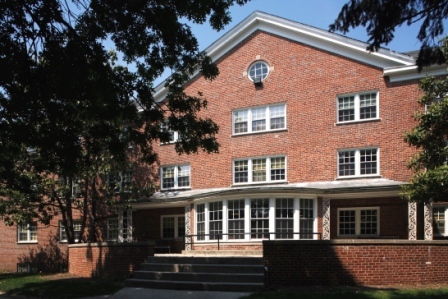 After mold was discovered in the basement of Hanson Hall, a first-year residential facility in the East Quad at Gettysburg College, residents of the all-female floor, the only such single gender floor in first-year residential facilities, were relocated to other vacant locations on campus for the remainder of the spring semester. An email from Associate Dean of College Life for Residential and First-Year Programs Keira Kant sent last week indicated that precautionary air quality tests conducted on the first, second, and third floors of Hanson Hall did not indicate any issues and remediation work would not begin until the conclusion of the semester. However, today, Kant sent another email to remaining Hanson Hall residents stating that, on the recommendation of Compliance Management International, an environmental consultant retained by the college, remediation work would begin immediately. Work will proceed one floor at a time beginning in the basement. After the basement is cleaned, first-floor residents will move to the basement while the first floor is cleaned; then, second-floor residents will move to the basement while that floor is cleaned, and, finally, third-floor residents will move to the basement while that floor is cleaned. The college has contracted INX Technology Corporation of PA, a bioremediation professional, to conduct the cleanings. Each floor will take about two weeks during which residents will not have access to their original rooms, but can leave many of their belongings behind. According to Jamie Yates, Executive Director of Communications & Media Relations, students will not begin moving for 10-14 days as basement cleaning just began. Students who originally resided in the basement will not be required to move back there after all cleaning is done because they have already had to move twice, she added. The college has been working to consolidate rooms in other residence halls to make room for displaced Hanson Hall residents, and some residents briefly lived at the Gettysburg Hotel while the college worked to find them permanent on-campus housing. Yates said that, to date, the college has no knowledge of any students experiencing adverse health effects due to the mold issues. Sherman also noted the hassle of having to move temporarily. Staff Writer Maddie Neiman contributed to this report.